Amatrol’s Set-up Reduction Multimedia Courseware (MXLM409) covers setup reduction, analyzing setup processes, internal tasks, external tasks, and streamlining changeover. This online lean manufacturing course teaches learners ways to identify and eliminate waste in order to improve quality, reduce production time, and decrease cost in order to drill down manufacturing processes to what is value added. 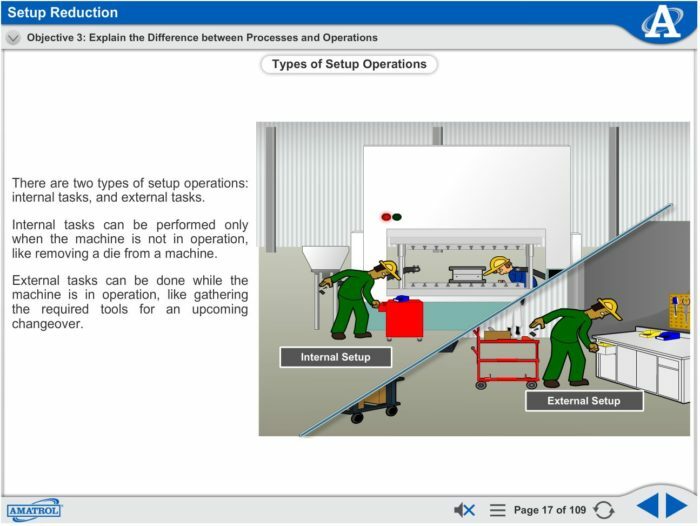 Set-up Reduction includes concepts for learners such as setup and SMED overview including large-lot production; preparing for SMED including the four phases of traditional setup and transitioning from traditional to SMED; separating external setup and internal setup tasks; converting internal setup tasks to external setup tasks; and streamlining all setup tasks including stages 1-3 of SMED (implementation, tracking, and creating an action plan for open issues at the end). Amatrol’s eLearning curriculum is unique in that it thoughtfully combines in-depth theoretical knowledge with practical, hands-on skills. This powerful combination of knowledge and skills solidifies understanding and creates a strong foundation for pursuing more advanced skills. Learners begin with an introduction to set-up reduction and lean, including how set-up reduction applies to lean manufacturing. Individual lessons focus on topics like the importance of set-up reduction in small-lot production, the differences between processes and operations, and defining single-minute exchange of dies (SMED). In this module, learners will advance to analyzing set-up processes. Individual lessons focus on topics like the four phases of traditional set-up, and how to analyze a set-up procedure for SMED. Continuing to advance through Amatrol’s set-up reduction eLearning curriculum, learners will study internal and external tasks. Individual lessons focus on topics like three types of set-up tasks, three techniques for separating external and internal tasks, and three techniques for converting internal tasks into external tasks. To conclude the module, learners will dive into streamlining changeover. Individual lessons focus on topics such as six organizational techniques for streamlining set-up tasks, four common steps to reduce changeover time to single-digits, and parallel operations. Learners will also understand basic set-up reduction skills, including topics like how to substitute functional tooling, how to eliminated adjustments during set-up, and how to document SMED progress. 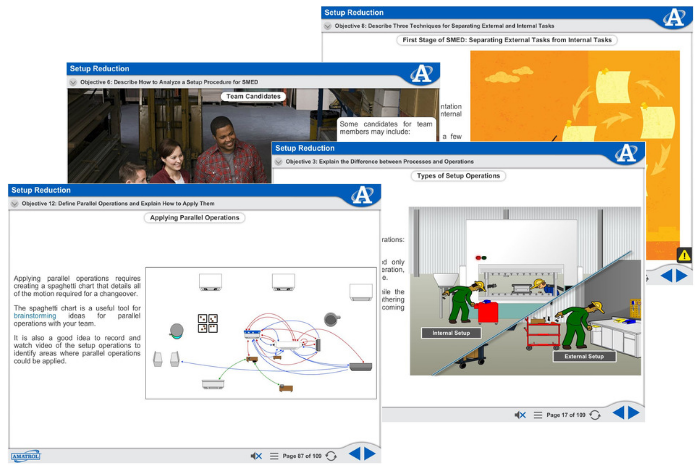 Amatrol’s Precision Gauging eLearning course curriculum features a highly-interactive multimedia format. Stunning 3D animations, videos, pictures, voiceovers of all text, and interactive quizzes and exercises bring learning to life. Amatrol’s multimedia curriculum contains elements that will appeal to every learning style, keeping learners motivated and engaged. In today’s fast-paced, technology-driven world, it’s more important than ever to extend the reach of industrial skill training beyond the borders of traditional classrooms. Amatrol’s eLearning meets the challenge for flexibility by offering in-depth, comprehensive technical skills training via an intuitive, easy-to-use web-based Learning Management System (LMS). With anytime, anywhere online access, Amatrol’s eLearning allows learners to set their own pace at home, on the job, in a traditional class setting, or a blended approach of these options. Click here to learn more about Amatrol’s eLearning and LMS.